← Prey for Me by TR Fischer ~ Author Interview & #Giveaway!! Below you will find three different books, by three different authors, and beneath each, you will find three different short excerpts. Only one excerpt is from the listed book. Using the form at the bottom of the post, enter your guesses as to which excerpt is correct for each book. 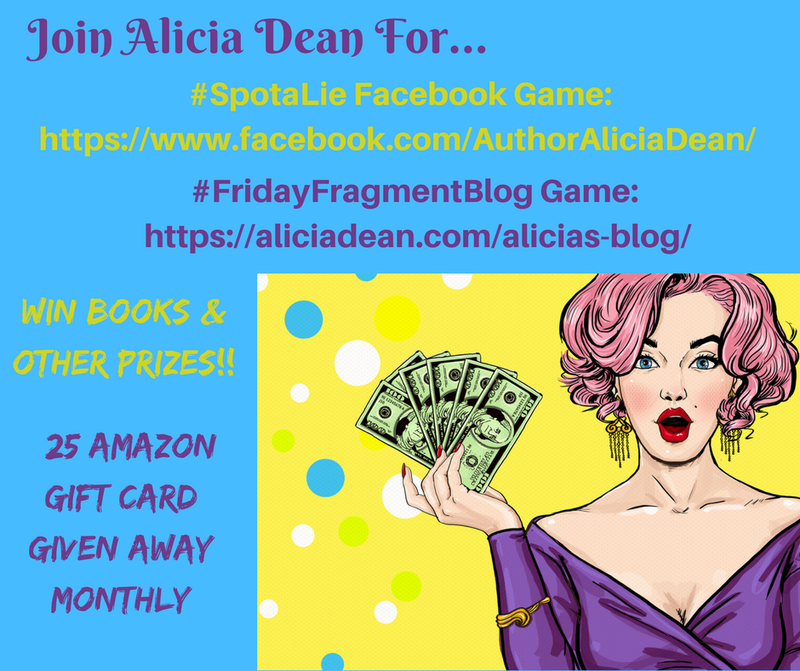 Once a month, I will draw a name from all those who attempt a guess on this game, AND on my Facebook SpotaLie game (check it out here: https://www.facebook.com/AuthorAliciaDean/) The winner will receive a $25 Amazon gift card. Each week, the first person to guess all 3 correctly receives an additional entry. (TIP: Click on each link and read the blurbs for a better chance at guessing correctly) – Remember, you get an entry just for guessing! In addition to filling out the contact form, we’d also love it if you would comment, whether it is about your guesses, the books, the authors, etc. (when we offer extra giveaways, commenting is usually the only way to enter.) Last week’s Giveaway winners: Mary Anne Landers won a $5 Amazon Gift Card and Elf won an Ebook or audiobook set of all three Jane Barnaby Adventures books by J.J. DiBenedetto. Congrats, ladies! Terms and Conditions: No purchase necessary to win. There is no limit on how many times one entrant can win. You do not have to guess correctly to be entered in the monthly drawing. *** The game runs from the day it’s posted through the following Friday morning when the next post goes up, so feel free to send your guesses in and comment any time during that week. In order to stay up to date on each post, follow my blog by signing up in the column to the right. Dane was lucky more than smart. Lucky more than charming. Shana might have left the island and him for good. He had no idea why she hadn’t put her bags on a ferry, taken off from Martha’s Vineyard and never looked back. Instead, she had moved a few blocks away. It felt like she was on the dark side of the moon. “You should have at least worn a coat,” he growled. As if she hadn’t thought of that already. She rolled her eyes. “Nobody likes a know-it-all. Could you just…?” She froze when he lifted a hand toward her face, gulping the rest of her words. What was he doing? Gaze flashing to his, she couldn’t move, couldn’t speak. His eyes glittered golden fire streaked with dusky green, his face intent and absorbed. 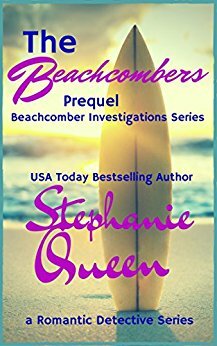 When his fingertips touched the side of her neck, she gasped and leaned closer. He caught her arm before she could slip into the Shadow. “Is broken how you see me?” Her head rose slowly as if she were reluctant to meet his gaze. A furrow creased her brow and something like pain darkened her green eyes. “No, I don’t see you as broken.” In that moment, he believed her. Maybe it was just something he needed to believe, or maybe it was the look in her eyes. The hint of darkness made him ache to hold her. He could drown in those eyes. She held very still, fighting the pull of him, the pure, magnetic energy which demanded a response. He’d be hard to resist in an interrogation room. Suns help her, he was hard to resist outside of one. Would he be this demanding in bed? She blinked at the errant thought and a flush of heat rose up over her skin. Now was not the time for her libido to kick in, but his gaze didn’t waver from hers and she was having trouble thinking. Alex took two silent steps on the thick carpet and was now standing right next to her. Monica stood up mechanically. Her mind raced trying to unjam the clutter of words clogging it. She put out a hand in a brusque move. “Brown-red of Fanari and Gray of Alivery.” Alex raised his full black brows. “Excuse me?” “The … marble. The types of marble down in the lobby and up here,” she said, aware that a “Nice to meet you” might just have been a better way to introduce herself. Last week must have been a tough one, no one guessed correctly. Thanks for the prize! I’m afraid I am going to be guessing this week as well, hopefully with better results. 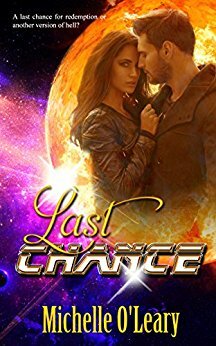 I enjoyed reading the excerpts and wish Michelle good luck and congrats on her upcoming release!